I can picture the board room where this idea was pitched. It’s the ’90s, you’ve got a hot property that just released a movie that has a soundtrack and you want to make as much money as you can, right? Also happening at the same time is this saturation of near-scam 1-900 phone numbers with insane per-minute rates that let callers experience their favorite properties while they pay through the nose. Why not combine them? So the CD for the soundtrack probably cost $16. At ten songs, that’s $1.60 a song. Let’s assume “Turtle Power” got a single, so that’s $4 for the single that you then play as many times as you want. 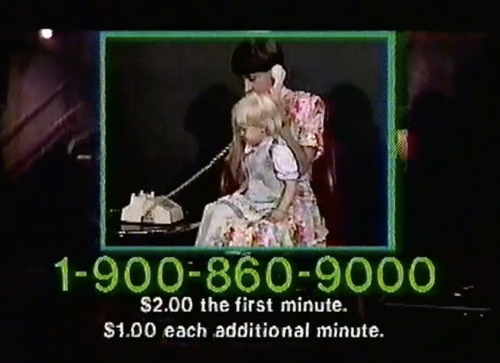 Or, hear me out, you pay $2 for the first minute and $1 each additional minute to hear that same single ONE TIME! It’s a 4 minute track, so that’s a $5 investment – and that’s assuming there’s no prolonged intro that racks up even more fees, which you know there absolutely is.